This is the full version of a letter published by the West End News (Edmonton) on August 16, 2010. We are a small, quiet community with a friendly and neighborly manner. Most of the residents have enjoyed a welcoming attitude in this ethnically diverse community. 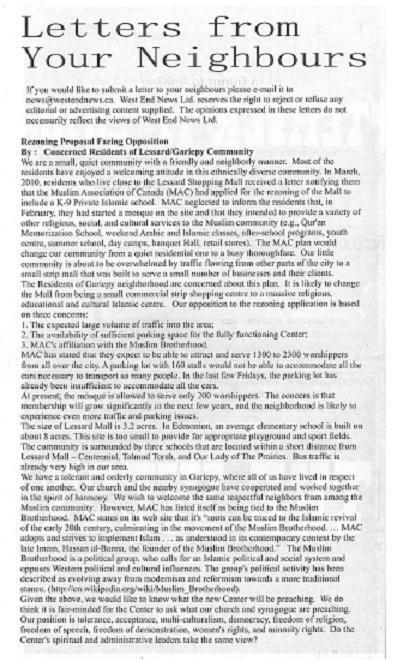 In March, 2010, residents who live close to the Lessard Shopping Mall received a letter notifying them that the Muslim Association of Canada (MAC) had applied for the rezoning of the Mall to include a K-9 Private Islamic school. MAC neglected to inform the residents that, in February, they had started a mosque on the site and that they intended to provide a variety of other religious, social, and cultural services to the Muslim community (e.g., Qur’an Memorization School, weekend Arabic and Islamic classes, after-school programs, youth centre, summer school, day camps, banquet Hall, retail stores). The MAC plan would change our community from a quiet residential one to a busy thoroughfare. Our little community is about to be overwhelmed by traffic flowing from other parts of the city to a small strip mall that was built to serve a small number of businesses and their clients. 3. MAC’s affiliation with the Muslim Brotherhood. MAC has stated that they expect to be able to attract and serve 1300 to 2300 worshippers from all over the city (http://lessardcommunity.wordpress.com/). Such a plan would create much more traffic in the area. A parking lot with 160 stalls would not be able to accommodate all the cars necessary to transport so many people. In the last few Fridays, the parking lot has already been insufficient to accommodate all the cars. Similar to other Islamic Centers/mosques, the community expects that this mosque will attract more and more members in the coming years. At present, the mosque is allowed to serve only 200 worshippers. Is it possible that MAC invested more than five million dollars to buy a property that would serve only 200 people? The concern is that membership will grow significantly in the next few years, and the neighborhood is likely to experience even more traffic and parking issues. The size of Lessard Mall is 3.2 acres. In Edmonton, an average elementary school is built on about 8 acres. This site is too small to provide for appropriate playground and sport fields. The community is surrounded by three schools that are located within a short distance from Lessard Mall – Centennial, Talmud Torah, and Our Lady of The Prairies. Bus traffic is already very high in our area. Adding a fourth school will increase the traffic volume and the demand for parking that could not be accommodated in the small site, making a difficult situation an unbearable one. 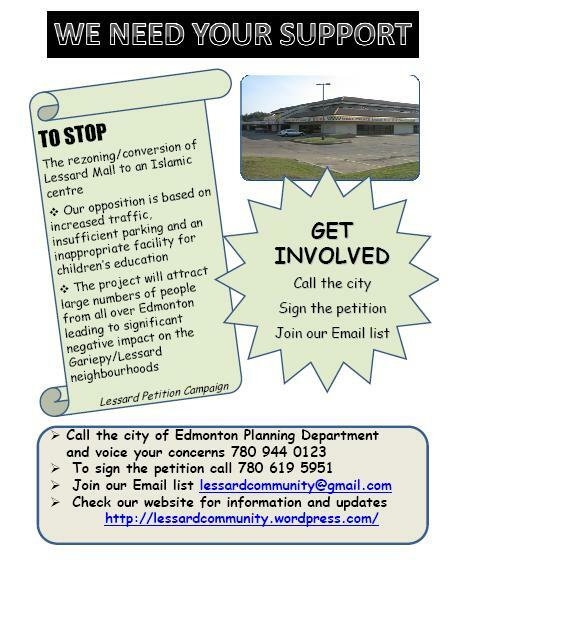 Recently a number of schools in Edmonton were closed and many more have significant surplus space that could easily accommodate the 150 students proposed for the school. MAC should consider the use of these facilities, which are designed to accommodate school age children. They have already been zoned for a school and they offer the required playing fields which are not available at the Lessard Mall site. In addition, across from Lessard Mall there is another religious centre – St. Anthony’s Ukrainian Orthodox Church. During religious events, traffic is already high and parking in the neighborhood is an issue. The proposed Islamic Centre will further aggravate the situation. We have a tolerant and orderly community in Gariepy, where all of us have lived in respect of one another. Our church and the nearby synagogue have cooperated and worked together in the spirit of harmony. We wish to welcome the same respectful neighbors from among the Muslim community. However, MAC has listed itself as being tied to the Muslim Brotherhood ( http://www.macnet.ca/about/). MAC states on its web site that it’s “roots can be traced to the Islamic revival of the early 20th century, culminating in the movement of the Muslim Brotherhood. … MAC adopts and strives to implement Islam . . . as understood in its contemporary context by the late Imam, Hassan al-Banna, the founder of the Muslim Brotherhood.” The Muslim Brotherhood is a political group, who calls for an Islamic political and social system and opposes Western political and cultural influences. The group’s political activity has been described as evolving away from modernism and reformism towards a more traditional stance. (http://en.wikipedia.org/wiki/Muslim_Brotherhood). Given the above, we would like to know what the new Center will be preaching. We do think it is fair-minded for the Center to ask what our church and synagogue are preaching. Our position is tolerance, acceptance, multi-culturalism, democracy, freedom of religion, freedom of speech,freedom of demonstration, women’s rights, and minority rights. Do the Center’s spiritual and administrative leaders take the same view? Edmonton: La section canadienne des Frères Musulmans menace de poursuite. Click HERE. Who Is Behind The Islamic School Being Planned For West Edmonton? Click HERE. Opposing Hassan al-Banna and the Muslim Brotherhood Is Not Some Kind of Racism. Click HERE.